“The superior man,” says the Analects of Confucius, “cannot be known in little matters but may be entrusted with great concerns.” As an ardent scholar of Confucianism, it appears that President Xi Jinping has taken this advice to heart. In March, Xi orchestrated the abolition of constitutional term limits for assuming presidency effectively making him the “chairman of everything” for life and entrusting him with the great concerns of party, military and state. Xi’s consolidation of power likely has two objectives. The first is personal – Xi seeks to cement his legacy. Since Mao, no other Chinese leader has crafted such a cult personality. Having christened himself “Core Leader” at the 18th Party Congress in 2016, he has now firmly entrenched “Xi Jinping Thought” in the constitution, placing him on par with Mao Zedong and Deng Xiaoping. Xi is aware that China is at a critical juncture. He believes the time is right for China to reclaim its place in the world; and to supplant Western powers – especially America – as the leader of the international system. To view Xi’s power play as selfish dictatorial ambition, then, is superficial. Instead, it has more nuanced implications for China and the world. First, Xi understands that the Communist Party requires a new social contract with its citizens. Over the past 30 years, China’s trailblazing economic growth has created a prosperous middle class and skilled professionals – many of whom now demand a better quality of life over high growth rates alone. Secure with his own position, Xi might be in a position to experiment with political reforms that could address this contradiction, and advance his “better life” agenda – including improving “deliberative democracy” by politically empowering local officials and creating new channels for public accountability. Second, the pace of institutional reform will increase exponentially. As China becomes a global power, Xi understands that “going out” will require new standards for transparency, governance and performance in the economy if he is to sell “socialism with Chinese characteristics” to the rest of the world. Already, the National People’s Congress is assembling to consider enacting such reforms this year. Perfecting a unique blend of state control over industry and free markets will require painful and complex restructuring of administrative and economic institutions – and Xi wants an uninterrupted stint to see these reforms through. Third, Xi has staked his legacy on the Belt and Road Initiative – the key instrument for his ambition of integrating Asia into a governance architecture that is more politically and economically cohesive than its sub-regions. The BRI must overcome several regional competitors to achieve its ultimate goal: creating new markets for high end Chinese goods in Europe. And Xi has made it clear that he is willing to use coercive statecraft to achieve this objective: ranging from Doklam-esque standoffs with India to “debt trap diplomacy” with smaller neighbours. With Xi at the helm, Asia must brace for a forcible attempt to reconstitute its geographical, political and cultural borders. Fourth, Xi sees the reunification of democratic Taiwan with the mainland as a critical pre-condition towards achieving the “great rejuvenation of the Chinese nation.” Already, Taiwan is a souring flashpoint between the incumbent super power – America, which recently voted to increase government and civil society interaction with Taipei – and China’s rising ambition. Xi’s consolidation of political power, coupled with his agenda for institutional and functional modernisation of the army, and militarisation of the South China Sea point towards rising tensions on this front. Finally, Xi faces the Putin paradox: massive concentration of power creates political losers; many of whom will often seek to exact violent revenge. Xi’s expansive anti-corruption drive, renewed political interference in companies, and rigid ideological control over public spaces have not all gone down well with China’s elites. At the same time, Xi will now also be seen as singularly responsible for policy failures – ranging from the economy to foreign affairs. Having amassed enormous power he must somehow craft a successful model for political transition when he does step down; or else face dire consequences for himself and for China’s stability. Xi’s power grab will likely be a turning point in history. It brings stability at a time when China’s comprehensive national power is at its highest since ancient times; even as America and other Western democracies struggle to manage the international order they created. 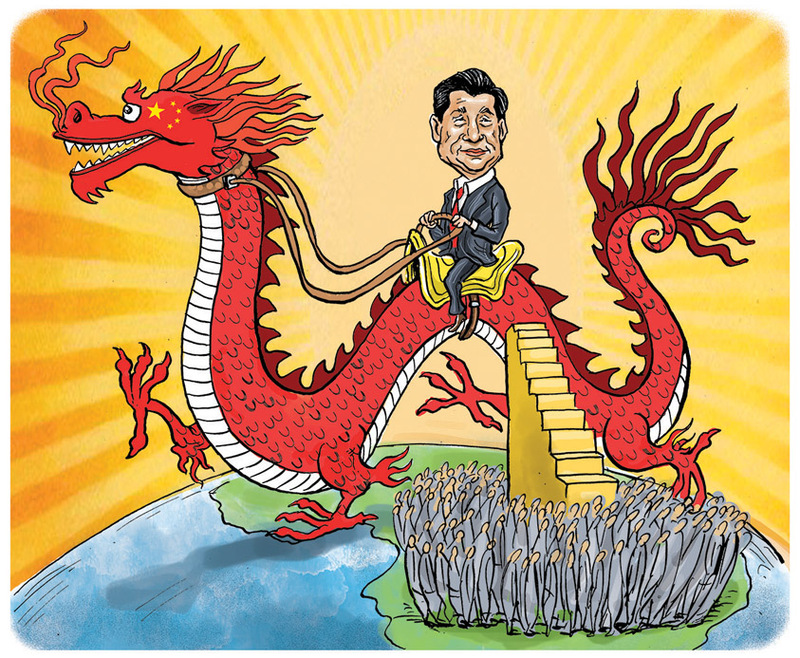 Simultaneously, China is a state and society in flux – high economic growth has created new political expectations and demands; and China must now shed its export led manufacturing strategy to embrace a new investment led model for the economy. “Our mission is a call to action,” declared Xi at the 19th Party Congress, “let us get behind the strong leadership of the party and engage in a tenacious struggle.” If Xi can carry out his mission, he will not only oversee the arrival of China as a great power, but will also emerge as arguably the greatest leader China has ever known in modern history. Source: Times of India, March 30, 2018.